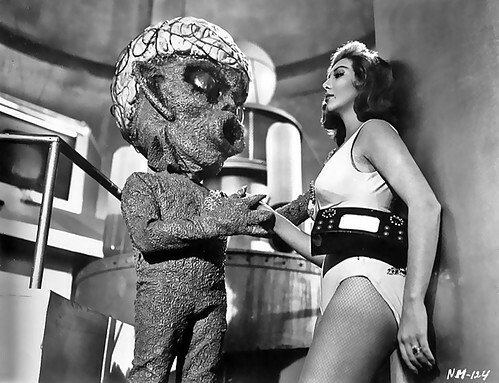 1960 … formerly unknown Mexican sci-fi!, a photo by x-ray delta one on Flickr. The being had crossed all of known space to find her, Lola LaBozla, the smartest woman on Earth. It had tracked her from Earth orbit using the prototype of her own wearable artificial intelligence unit and spaghetti cleanser (AIUSC), that while bulky, had a certain caché and definitely worked with her fish-net stockings. Of course, she realized right away that a being from another star system was using the AIUSC to track her movements, and she was intrigued. Who was this person? Was it a person, or was it some kind of hive mind that inhabited a pile of pasta bacterium? She was relieved to discover that it not only an individual, but he had a form that was more or less humanoid. She felt this was further evidence of the Anthropic Principle. He had two arms, two legs, and a giant mouth in the middle of his face that had possibilities. His reflective bug-like eyes and claw like hands were a little off-putting, but she was encouraged by the size and girth of his cranium. She just hoped he wasn’t too attached to the shower cap. Laying off the pasta? Read some of my long fiction — guaranteed gluten-free! Alltop is never without its ablutions hat. Originally published, October 2011.